Who makes the magic happen? ...getting a dog to beg. Isa don't like those naners but my sister Stella Rose sure does. So how do you freeze them if not letting them clump together? Next time Mom says she's gonna put them on one our ice packs or a large plate. We'll see how we go though. Frozen nanna Dina is a great idea. Must try it. Have a wonderful Wednesday. Bananas are a big hit here. I will have to try them frozen. 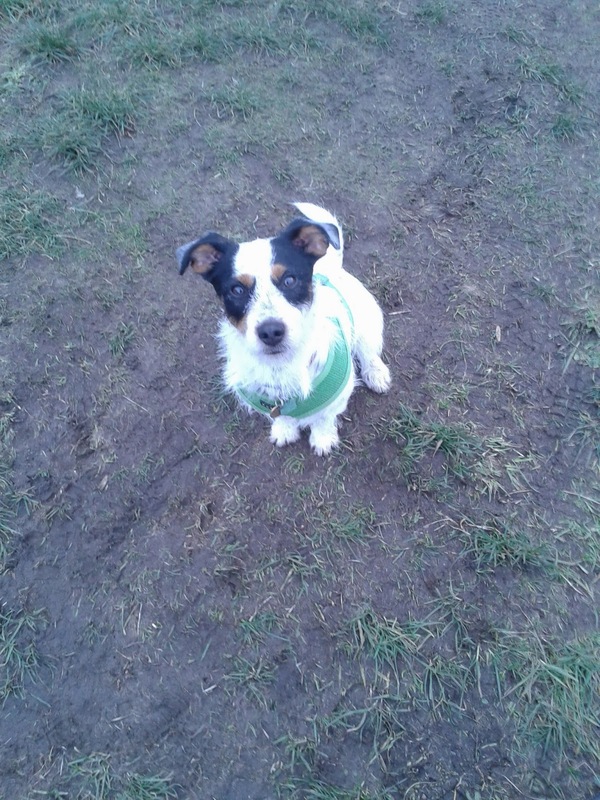 Dina is a (quite) small, female Parson Russel Terrier x Papillion who was born on 7th September 2012. She loves chasing toys of any kind, but her favourite is her frisbee, playing tug, training, trekking and -like most dogs- eating. Mom is a (quite) young, short human who is into positive reinforcement dog training, reading, trekking and generally spending time with Dina. She one day hopes to be a dog trainer like Emily Larlham, Pamela Johnson or Kyra Sundance or a vet. Dog The Dina started in March 2013 as the result of reading multiple blogs and wanting to give it a go. Firstly, it began as a blog which documented the life of a fun terrier and her Mom. However, as the first bloggaversary neared the Dina and Mom felt that day-to-day blogging wasn't their thing. Instead they began blogging about their hikes/treks in the South East region of England, Mom's training and various other things they felt were significant (or not so significant). This blog is not written regularly, rather whenever either Dina or Dina Mom feels the urge to write. Now you know a little bit about them, go and join the TTE family- they have cookies! I am open to doing reviews for pet product companies or shops that make dog products. Note: I shall not review any products that promote forceful training or that may endanger my dog or any other dog as a result of my review. April Showers Bring Snow? - While the rest of you might be looking for May flowers, we were a little surprised yesterday to discover that April showers bring snow. Silent Sunday 4/21 — To The Bunny Trail - Houndstooth Tales and Tails - The hilarity of everyday life The post Silent Sunday 4/21 — To The Bunny Trail appeared first on Tales and Tails. Badger Weir Park - Healesville - Photos of April 20, 2019 (Easter Saturday) on an exploration of this newly reopened Park. Pixel Blue Eyes - Her "Tails of Adventure"
Newborn baby in Campbell, CA - Here are some photos I took of a beautiful five day old baby in Campbell, CA and the metal print they chose for their wall. All About Max ...My Chihuahua Mix Dog...Dog Product Reviews, Etc. Amazing Grace - a young pup's journey. B&W – Do Not Disturb - Today we’re participating in the Black and White Sunday blog hop hosted by Dachshund Nola and Sugar The Golden Retriever. Thank you Nola and Sugar! Boomer - Boomer and his buddy Ace!